← Memo to WashPost: No royalty here! Without waiting for congressional approval, President Obama recently took an executive action to change up the art work that he looks at during his long work days in the Oval Office. Since last week, there have been two landscapes by Edward Hopper in the room — on loan from the Whitney Museum in NYC. The paintings, classic Hoppers from the 1930s, show the rural landscape on outer Cape Cod. Wishing he could get away? I’m not sure it should hang in the Oval Office, though. I think I would find those eyes impossible to ignore, and I’d get nothing done. 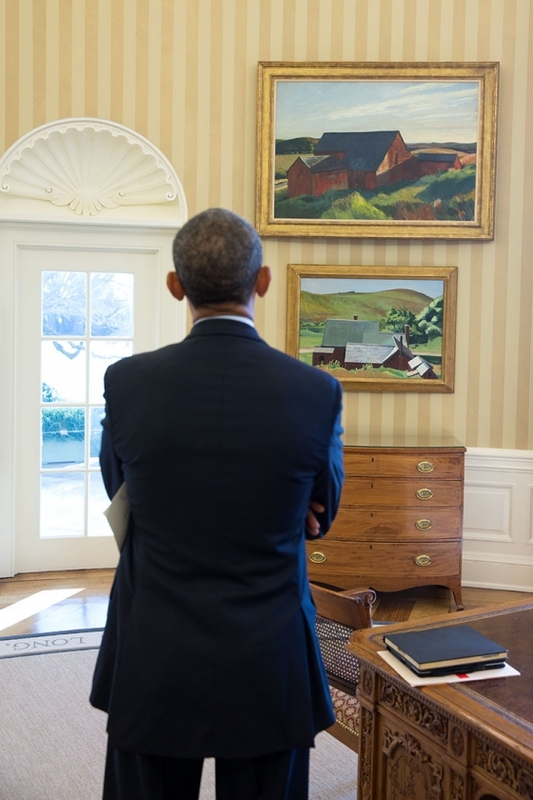 Two paintings by Edward Hopper (1882–1967), widely recognized as one of the most significant artists of the 20th century, were hung in the Oval Office on Friday, February 7, 2014. Cobb’s Barns, South Truro, and Burly Cobb’s House, South Truro — oil on canvas works painted in 1930-33 on Cape Cod — have been lent by the Whitney Museum of American Art in New York, the world’s largest repository of Hopper’s works. Before building a house on Cape Cod in 1934, Hopper and his wife rented a hillside cottage for four summers. From that house, Hopper executed a series of paintings and drawings of the buildings on their landlord’s farm below, exploring the structures from several angles and at different times of the day. 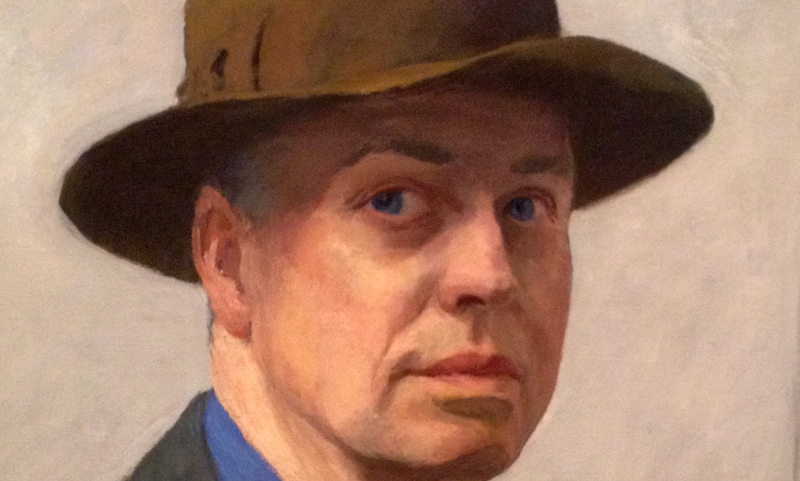 Emblematic examples of his work, the two paintings lent by the Whitney Museum capture the strong sense of atmosphere and light as well as the empty stillness that characterize much of Hopper’s imagery. They also demonstrate Hopper’s fascination with the various forms of this country’s vernacular architecture — a subject he would return to again and again, resulting in some of the most enduring images of American art. All five of these works belong to the permanent White House collection, which does not include any works by Edward Hopper. Another notable change to the items hanging in the Oval Office is the removal of a rare printed copy of the Emancipation Proclamation signed by President Abraham Lincoln. As a document on paper, it needed prolonged rest from further exposure to light. As a loan to the White House, its preservation required its removal.